Rocco Baldelli’s lineup card for the Minnesota Twins’ series-opening game against Toronto on Monday night looked a bit different than usual. He did something no Twins manager has done since 1980: starting a game with a catcher batting first. Getting his eighth starting nod of the season, catcher Mitch Garver was slotted as the Twins’ leadoff man, as outfielder Max Kepler, who has hit first in all 12 games he’s played in 2019, got the day off. The leadoff spot is typically reserved for a player who has a knack for getting on base — whether it be via hit or walk. Despite the stereotypes of being a catcher, Garver does that well. Among players with at least 25 at-bats this season, Garver ranks second on the Twins with a .444 on-base percentage, trailing shortstop Jorge Polanco (.464). And if you want to expand that out to a larger sample size, Garver’s .335 on-base percentage in 2018 ranked fifth on the Twins — behind Robbie Grossman (.367), Joe Mauer (.351), Polanco (.345) and Eduardo Escobar (.338). Of course, three of those players are no longer with the organization this season. Maybe Baldelli wasn’t so crazy after all. Regardless, it’s a rarity in baseball to see a catcher lead off the game. Garver is the third Twins catcher to start the game hitting leadoff, and the first since Butch Wynegar in 1980. Technically, two other Twins catchers have hit leadoff, as well. Super utility man Cesar Tovar, who hit leadoff in 1,002 career games, played an inning of catcher during his famous stunt Sept. 22, 1968 when he played all nine positions in nine frames. 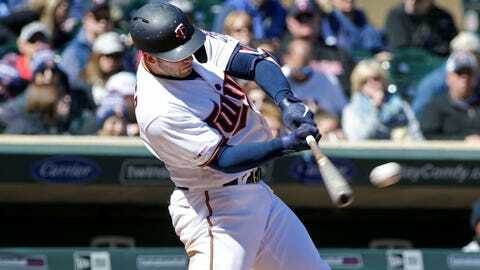 Joe Mauer hit leadoff in 104 career games but never as a catcher, although he was the leadoff hitter when he subbed in at catcher in his final MLB game last fall. Back to Garver. He’s just the 39th catcher in MLB history to hit leadoff to start a game. Jason Kendall, who starred for Pittsburgh and Oakland, among other teams, from 1996-2010, led off the game as a catcher 452 times, including a record 119 games in 2004 alone. The previously mentioned Wynegar has the third-most leadoff games in league history, trailing Kendall and John Jaso. Even though Garver went 0-for-4 Monday night against Toronto in the leadoff spot, we’ll likely see him back hitting first at some point this season. That on-base percentage speaks for itself.